At present time Android phone occupied a large area around the world. Android phone automatically scan your picture and videos in your phone. There are lot of media files which are important for us and you don’t want to view those files. This article helps you how to hide and unhide media files on Android phone. You must have to keep safe your important and private media files on your Android phone. If your private media files are unhide anyone can view your files. You have to hide and unhide media files on Android phone as per your need. You can not only hide any particular media file but also hide any particular folder that contain images, videos. You have to hide and unhide media files or folders as per your need from your Android phone. If you want to hide and unhide media files on Android phone, you have to take following steps. If you want to hide your personal images or video from your Android phone, you have to take following given steps. Step 1: Open your ES File Explorer or any other favourite file manager on Android phone. Step 2: Select any file or folder which you want to hide from gallery of your Android phone. Step 3: Tap on the rename option and put a single dot (.) before the name of any media file or folder. There is no need to set the space between . and file or folder name. Now, your selected file or folder is invisible from your Android phone. If you have default file manager then you are not able to unhide media files or folder. You have to use ES File Explorer, E-Plore or Astro file manager to unhide the media file or folder. 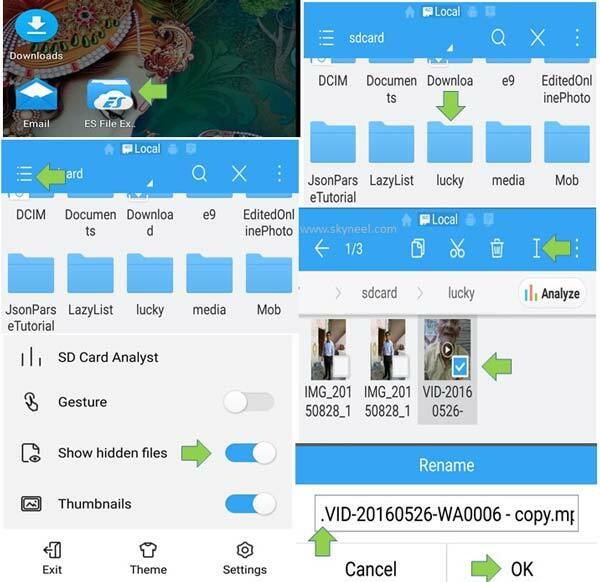 If you already hide media files or folder from Android phone and want to get back again. 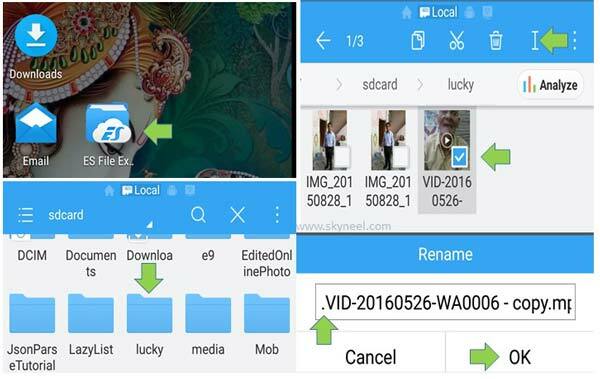 Now, you have to take few simple steps to unhide media files or folders from your Android phone. Step 2: Tap on the three dot (Menu) button of ES File Explorer. The menu button is placed at the top left corner of your window. Step 3: Turn on “Show hidden files” option. Now, get back on home screen of ES File Explorer window. Step 4: Swipe left until you see list of all folders which you want to unhide. Tap on the file or folder name and tap on the edit name button (I). Remove the dot from the name of active file or folder. Now, you can view all hidden file or folder from your Android phone. After reading this article you can easily hide and unhide media files on Android phone. It’ll helps you to keep safe your important and personal media files. If you have any suggestion regarding this article than write us in the comment box. Thanks to all. Thank you so much for your help!! I was finally able to open my files with this article! You’re the best! Please have a great time! !